Use this quality precision laser cut aluminum Highbanker / Dredge Hopper to convert your stream sluice into a highbanker or dredge. The removable classifier screen is made of gold colored zinc plated steel wire-- an improvement over the aluminum grizzly that used to catch stones which had to be removed by hand. 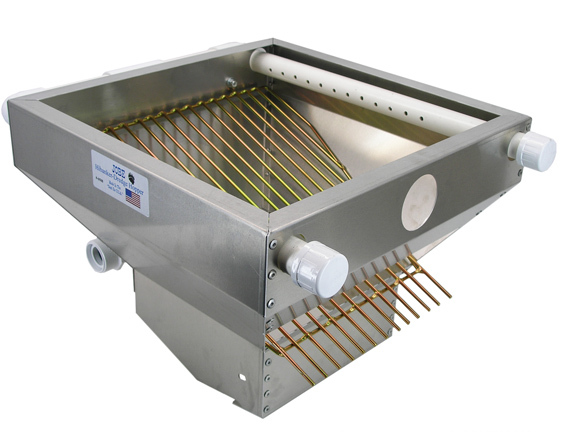 The top of the hopper is 18 inches x 18 inches with spray bars. The water inlet is equipped with a 1 1/2 inch slip fitting which can be removed to use 1 1/2 inch pipe fittings. The water supply can be adjusted with a valve which is included. Comes ready to go as a highbanker and can be rigged to use as 1 1/2 inch or 2 inch dredge hopper. Works on the JOBE brand 45 inch Yellow Jacket sluice, the Keene A52, or any 10 inch wide sluice. The mounting holes are precut to bolt onto the JOBE brand sluice and sluice stand. Mounting to the Keene A52 requires two 1/4" holes to be drilled on the sides of the hopper. Total weight is 15 pounds. Sorry, no instruction manual or directions for assembly are available for this unit from the manufacturer (Jobe), but it's basically self-explanatory.